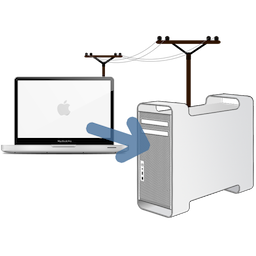 Install ChronoSync on all your networked Macs and configure them to backup to a central server. The advantage of this method is that each user's machine has more control over exactly what gets backed up and when. 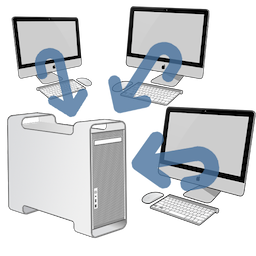 Backups can be configured to run when each machine is turned on, when it joins the network, throughout the day, before logging out, or all of the above! It provides users with easy access to their backed up data, allowing them to restore lost or archived files on their own. The disadvantage is, well, sometimes you don't want to give your users so much control! Install ChronoSync on a central server and have it connect to client computers to "pull" backups from them. Use standard file sharing or, for greater performance and flexibility, install ChronoAgent on each client machine. Schedule backups throughout the day or during off-peak hours. The advantage of this method is that it puts total control of backups in the hands of the administrator and it can be more cost effective. The disadvantage is that it becomes the administrators job to restore lost data for users. ChronoSync can be installed on mobile laptops and configured to connect to your central server over a secure internet connection or on your own private VPN. Perform backups as if you were sitting in your office. You can even retrieve lost or archived files, too! Configure remote bootable backups to maintain a mirror image of the entire hard drive back at the central office. Thus if the computer is lost, stolen or damaged, you can have it back up and running in a snap!